Isaac Lugudde Katwe (LK4) will be on the plane from South Africa and will be touching down at Entebbe airport at 7pm this evening. 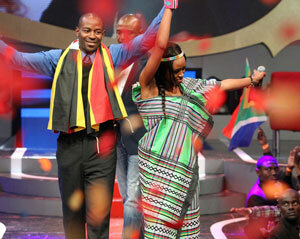 An interesting character, that former Big Brother Africa 8 representative of Uganda. Word on the grapevine is that Lugudde has been a bad boy. On his return, Lugudde will have to answer to child organisations after a lady (name withheld) filed a police case against him for child neglect. It is alleged that Lugudde sowed some wild oats and didn’t look back when they germinated. His alleged baby-mama wants Lugudde to own up and be a man. Meanwhile, according to his teammates – he plays for Dmark Power basketball club – his steady girlfriend Cynthia is breathing fire over the antics Lugudde has been pulling in the Big Brother house with South African Koketso and the fact that he did not mention Cynthia’s existence once, yet he had promised to marry her. Now she wants out, but first she wants him to look her in the eye and say why he lied. When Star Trail asked some of his teammates about the possibility of Lugudde neglecting his child, none of them was surprised; some said they can’t tell the exact number of Lugudde’s children. Poor Koketso, who was evicted largely because of her association with LK4! Poor Cynthia, who watched him tell BBA presenter IK that the biggest prize he was walking away from the game with was Koketso. Huh! Some playas give playas a bad name! BBA housemates n der stories 4votes! EishhhhhhhhHhhhhh!!!!! LK47 so my Girl Kokesto was a victim!! Will never 4give u! Joshua is d **f** activity an achievemt? Hail no! SA face d fact d dude was jus hittin on ur gul koketso.thank God our berverly is smart and stp hatin on nija.LK4 father of all nation. Y hating 9ja stupit , we don't have time for that coz 9ja is not the country which determine the stayed or evectee BIG NO .do you problem with mzansi oh no plss stop this fullishness of your , is time to unite as african show some loves mxm , empty pride full of corruption and defraud. Ths shuld b a lesson 2 these other couples left in da house, especially dat Betty chick, if she keeps on being Bolt's pupet, she shall be evicted jst lyk Koketso ws.. We all know dat keketso ws evicted bcos she ws 4evr glued 2 dat lk wat wat. Hey! Everytin is nija nija nija,hating hating hating!can't u make a sentences wtout hating? God is der Strenght alwayz!! Africa Unites!! Not only a basketball er but also a prince. Lmao.south Africans supporting him for koketso really don't like her. She's more than him. Any body can also do that d some as LK4. What's this beef with SA and Naija we are all citizens of this land afterall it is God's Land, so please let's leave in it like mature and God's people. Thought as much. The beautiful Koki should please run for her dear life. Trust me the guy is pure rubbish. There were hotter and better guys in the house, dont know what these girls were thinking. Èlikem, Hakeem, Melvin Oniel are all better dude than LK4. So unfortunate that Koki got entangled with that guy. A man without class. Very funny that his mother told him to be very close to the Nigerian and SAan housemates if he intends to stay long in the house. Ironically that concept brought him down and unfortunately took a collateral damage in Koki. Very flippant. Koketso if you ever read this, find yourself a classy man.